Pizza in NYC can be confusing as there are many different varieties to choose from. Brick oven pizzas abound, but there are pizza lovers who won’t settle for anything less than a pizza baked in a coal-fired oven. The extremely high heat of a coal-fired oven cooks the pizza in just a minute, and imparts a crusty, charred flavor you can’t get any other way. There are only about a dozen coal-fired pizzerias in New York City, and many of them have been around for 100 years or more, so it’s definitely a matter of making a special trip to enjoy this style of pizza. So several years ago, when I heard through the pizza lovers’ grapevine that a “new” pizza was out there, one that was gaining a cult following, I needed to know about it. And more importantly, I needed to taste it! What makes Pizza Montanara so spectacular, quite simply, is that the dough is fried in oil before they put the sauce and cheese on it, and then they cook it in a wood burning oven. It is not greasy. The frying process, which lasts only a minute, puffs the dough up and creates a beautiful pillow-like softness that I’ve never experienced in a pizza before. Imagine a pizza cloud and you’ve got Pizza Montanara. 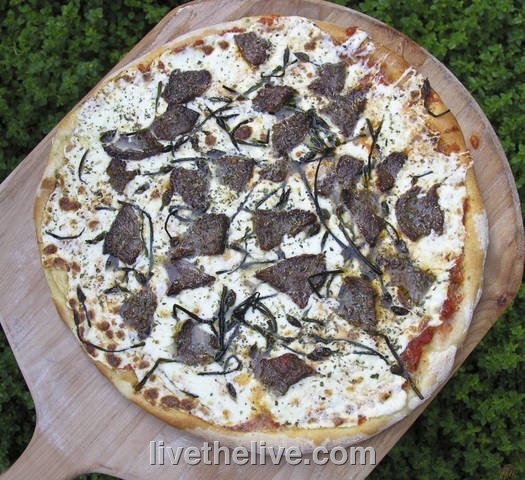 My signature pizza: marinated beef tenderloin with chive blossoms. Not Pizza Montanara, but not bad! I’ll be “living the live” in New York City this weekend. PizzArte already on the list for Friday night. Looks for the photos. I can’t think of anything better than an amazing Pizza Montanara before I go on my no-carb diet next week!